Linda May Studio produces hand crafted textile jewelry. Linda is a passionate maker, but more importantly, she is a powerhouse of marketing. The jewelry she makes is only the beginning of the creative process. She works very hard to present her work is just the right way. Linda May and Rowhouse Studio have been working together since about 2013. When we say working together, we mean she is possibly the most involved client we’ve had the pleasure of working with. Extremely organized and on point with all of her materials and how the work is scheduled. Whenever we begin a project she has a direction in mind for copy and presentation. That said, she is very open to ideas and when she hears something she likes, we run with it. A well-taken product photograph is worth everything, especially if you are attempting to sell online. 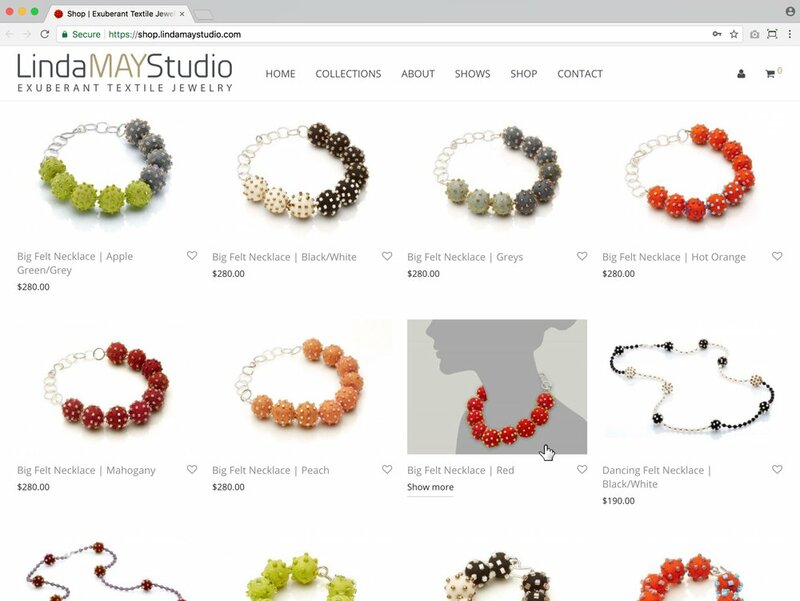 We took advantage of the high resolution, professionally lit photographs Linda provided of her jewelry by displaying bold, full width, responsive images of her work on the site. The enlarged images help to show details in the textile materials and craftsmanship used in creating a bracelet, necklace, or brooch. A simple color palette of dark grey, white, and bronze allowed the bright colors of Linda’s jewelry to leap off of the page. A long-scrolling “About” section describes the full creative process in almost story-like pacing. Linda wanted a two part site: A portfolio and product site. 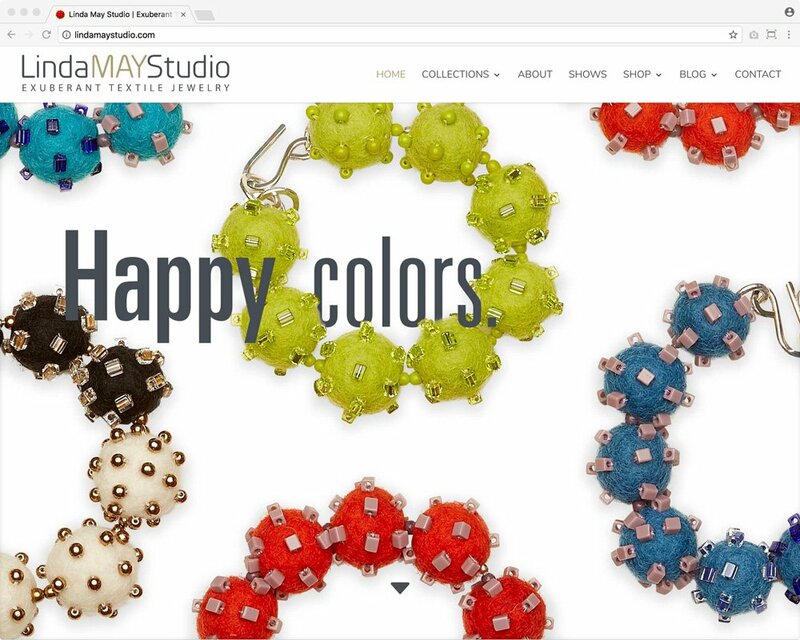 She wanted her e-commerce store to be interwoven, but not the direct focus on her portfolio site. The portfolio site was meant to playfully showcase her best work, while the e-commerce store acts as an elegant gateway to browsing, selecting, purchasing and ultimately owning a hand-crafted piece of wearable art. Linda’s portfolio and web store were built in WordPress. We worked in a page builder theme called Divi. That allowed us to quickly design pages with modules, rows and columns. Linda wanted to be able to “take the reigns” and later make updates to the site herself. Linda maintains a blog section on the site where she writes about her craft and inspiration. A WooCommerce store environment was tailored using custom code and premium plugins to provide a shop experience for retail customers, as well as a password-protected portal for wholesale customers. As a way to keep customers informed, we integrated Linda’s Mailchimp account so blog posts and marketing email blasts could be seamlessly distributed to contact lists. Finally, Google Analytics was implemented so Linda can gather data on which pages and pieces capture the attention of her visitors. This was one of our bigger e-commerce sites of the year in that we did everything except shoot the product images. We started with a full print roll-out with sell sheets, packaging and support materials. We then moved on to site diagrams, page designs and artwork. From there it was building and setting up the store. What made this project successful though was the dynamic between everyone here and the client. We were all in support of each other to make adjustments when needed and to get this out in the open.